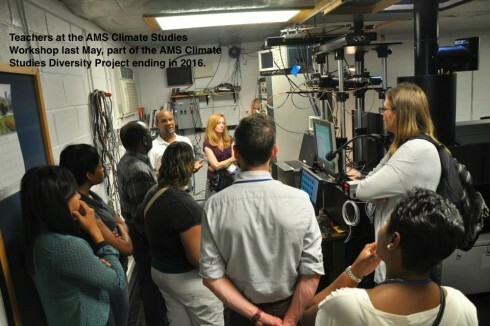 In a milestone year for the now 25-year-old AMS Education Program, one of the proudest achievements was the successful completion of the five-year AMS Climate Studies Diversity Project. This NSF-funded initiative introduced and enhanced geoscience and/or sustainability teaching at nearly 100 minority-serving institutions (MSIs) since 2011. The recent AMS Annual Meeting in New Orleans was the final event in the project; it included a Sunday workshop bringing together 18 faculty from minority-serving institutions who had attended the project’s May 2015 workshop on implementing the AMS Climate Studies course. The faculty not only attend the workshop; they also presented at the subsequent Education Symposium of the Annual Meeting. 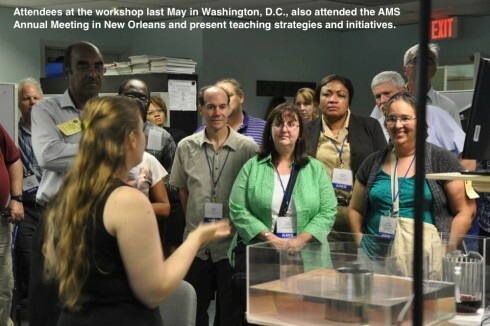 Overall in the Climate Studies Diversity Project, AMS was able to partner with Second Nature, a nonprofit working toward societal sustainability through a network of colleges and universities, to recruit 101 faculty to attend Climate Studies workshops in Washington, D.C. to learn from top scientists at Howard University, NOAA, and NASA. The attendees then incorporated the AMS Climate Studies course materials, real-time data, and lessons in their teaching. Since 2001, in faculty enhancement through the AMS Weather Studies and Ocean Studies courses and now the Climate Studies Diversity Project, AMS has engaged 24,000 students through 220 MSIs. The combination of noteworthy speakers and fascinating field trips made the workshop a very informative and engaging environment and I found myself absorbing a plethora of information. Upon walking out of our meeting room on the last day, I realized that I not only gained a wealth of knowledge on a variety of climate-related topics, but also gained a support system that I will hopefully have for the rest of my career. We were armed with valuable resources to help us tackle the challenge of teaching a brand new course or incorporating new material into existing courses. 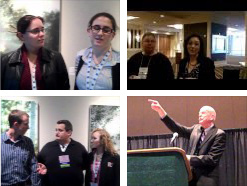 I learned about so many new websites, programs, initiatives, and funding opportunities. The field trips to NCEP, the Beltsville Center for Climate System Observation (BCCSO), and NASA Goddard provided an opportunity to see the operational side of the field. They were inspirational and motivating to say the least. In fact, I had a student email me a few days later asking for some ocean data. It felt good to be able to direct him to one of the NOAA Ocean Prediction Center sites that was shown to us during the NCEP tour. In addition to the arsenal of tools and resources we were given, the workshop provided indispensable insight and sense of community. There were quite a few quotes that left an impression on me, some of them being: “We did not get out of the Stone Age because we ran out of stones,” by Rear Admiral David Titley, and “every state is an ocean state.” However, the one that really resonated with me was from Frank Niepold, the Climate Education Coordinator at NOAA’s Climate Program Office, who mentioned that students are getting the majority of their climate information from unskilled, unreliable, nonscientific sources. That statement is overwhelmingly true, and it made me realize just how much of an impact we, as educators, can potentially have on our students. Another aspect of the workshop that I found intriguing was the diversity among the faculty in attendance. So many different institutions were represented, both large and small. The faculty also had various educational backgrounds. Our group of approximately 30 professors consisted of meteorologists, geologists, oceanographers, biologists, geographers, and everything in between. Regional differences were also very evident. For example, I teach on a campus that is approximately nine minutes from the coast, and found it fascinating that other workshop attendees and fellow colleagues have classes in which the majority of students had never been on a boat. These conversations sparked ideas for collaboration projects within the cohort and we were excited to present our results at the AMS Annual Meeting. The connections we made at the workshop can be just as important as content in making us effective leaders in an effort to help change the world with respect to climate education. On a more personal note, it can be a challenge for minority serving institutions to encourage their student body to pursue the STEM fields. The Earth science and physical science majors are extremely underrepresented in our population. We have few traditional students. My students range in age from 16 to 66. Some have full-time jobs. Some have families. Some are active military. Although they have the same drive, aptitude, and interests as traditional students, they may not have the resources. Many of them have academic dreams, but don’t know what opportunities exist. They don’t realize that NASA, NSF or other federal agencies would be willing to fund them if they were to pursue those dreams. They may be interested in the atmosphere or the oceans, but lack the motivation or confidence to make it a career path. It could be something as minor as not having the right information. Some of these students have a potential fire within and it is up to us to provide the spark to truly make them shine. We are on the front lines, not just for climate education, but STEM disciplines in general. Our voice is the bridge between can’t and absolutely can and I truly feel like the AMS Climate Diversity Project Workshop helped strengthen that voice. In fact, as I was writing this, I received another email from the aforementioned student that I gave the OPC link to. He is declaring that he wants to change his major to a physical science and wants to meet to discuss his options. This student also happens to be a minority. It’s pretty rewarding to see the impact that this workshop is already having before the course has even been taught. I hope to utilize everything I learned during that week to inspire my students the way that the workshop inspired me. One of the best decisions I have made was to apply for an announcement from Second Nature inviting professors to be part of the Climate Diversity Project from the American Meteorological Society. Our climatology course, which I have not taught, had not incorporated climate change. I was searching for more experience with climate change to integrate it to the curriculum at my school. Climate change has mixed meanings for students living in an island in the Caribbean. Most of the time, students underestimate and misunderstand the topic, mainly because it is seen as a future event, and because models have many uncertainties. Traditionally, water sources in Puerto Rico have been considered vast and sufficient for all purposes. However, this availability could be impacted by future challenges of climate change. Puerto Rico has experienced climate variability in terms of alternated extremely heavy precipitation in some areas and droughts in other areas that have driven potable water rationing. As the dean of the school, my AMS experience will help me in different ways to update the curriculum. First, I intend to include knowledge and evidence on climate change—NOAA data, NASA simulations, and current references—as part of the course of climatology. Then, we will include the topic in related courses: environmental science, Earth science, and oceanography. Finally, when I feel comfortable with the topic, I will teach the course of climatology myself. In the future, the school can move to consider a master degree in climate studies focused on preparing the population for mitigation and adaptation. We are responsible for preparing professionals for building resilience within communities, and to develop leaders who will have the ability to cope with external perturbations to society and its infrastructure caused by climate variability. More students need to understand Earth’s climate system and the evidence of climate change to evaluate potential impacts on human health and to improve the decision-making process.